A Pathfinder Society A Pathfinder Society Scenario designed for levels 1-5. Venture-Captain Roderus has long been one of the most reliable and steadfast allies of the Pathfinder Society in the nation of Katapesh, but the aging human has decided that it is time to retire from his long-held position. Roderus's retirement party draws in Pathfinders from across Golarion, but there are some who see his retirement as an opportunity to advance personal goals that go against the Pathfinder Society's interests. Amid the turmoil of a party turned crime scene, the PCs must uncover the true threat to the Society's stability in Katapesh—and perhaps make an unexpected new ally along the way. 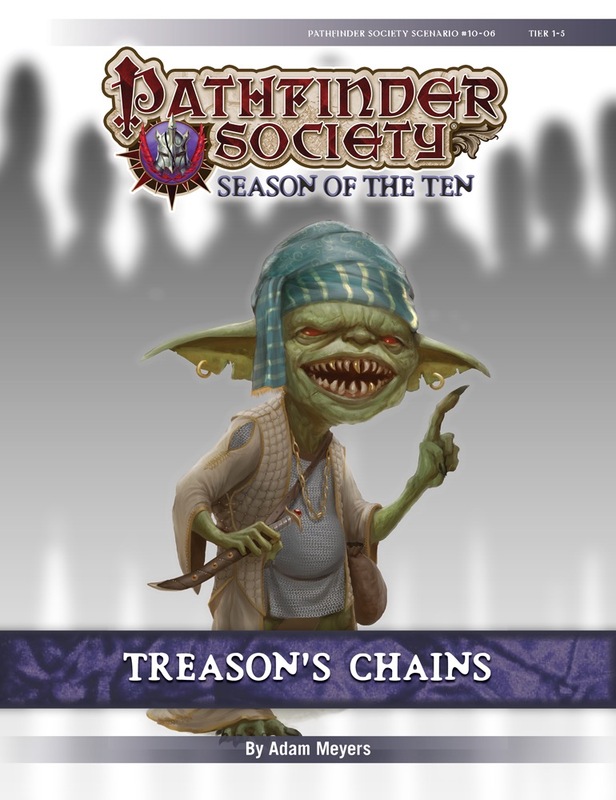 Contents in Treason's Chains also contribute directly to the ongoing storyline of the Liberty's Edge faction.